It's not uncommon for historical farmhouses to need at least a partial renovation to bring them up to today's standards. However, this 1790's farmhouse in the shadow of Massachusetts' Berkshire Mountains needed much more than that. When purchased by the current homeowners the home was in a state of disrepair where some rooms had been partly renovated and others were in complete chaos. 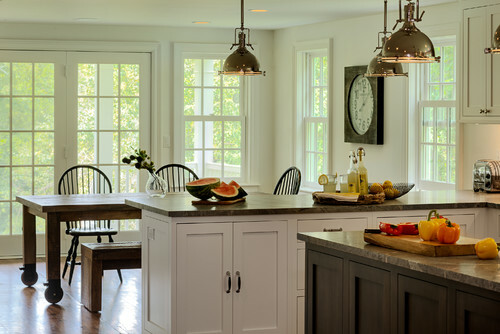 With the help of a knowledgeable architectural firm, Crisp Architects, the home was carefully restored to accommodate many of its original features. 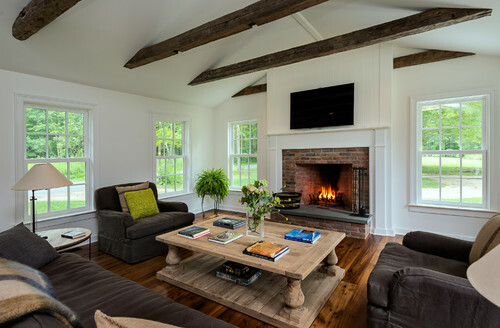 This spacious 3400 square foot home features exposed beams uncovered during the renovation process. 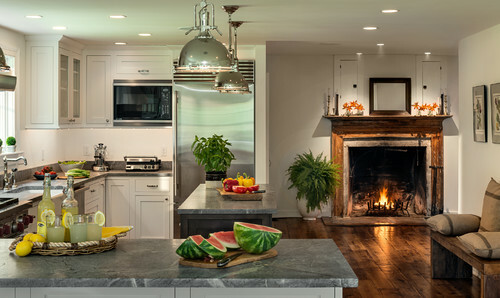 In addition, 3 of the home's 4 fireplaces are also authentic and still retain their soapstone hearths. New materials, like cypress mushroom wood, were respectfully selected to coordinate with the home's older elements. The culmination of this extensive project has resulted in a bright and airy home complete with plenty of farmhouse charm and all the necessary modern amenities. The newly-added mudroom provides a handy space to corral wet, winter gear and accessories. Just off the kitchen is one of the home's original fireplaces; a much-needed, yet beautiful, addition on those chilly winter nights. 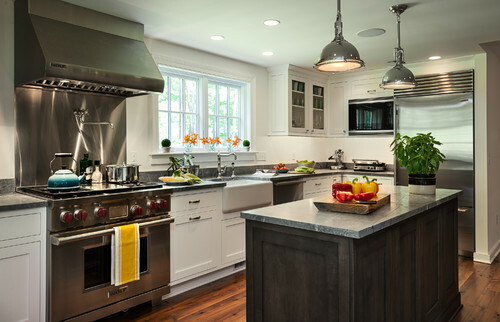 The cheery kitchen features white, Shaker-style cabinetry and stainless steel appliances. A space for dining is located in front of a row of large windows to allow those eating to catch a glimpse of the view outside. Exposed beams draw the eye upward to take in the living room's lofty ceilings. 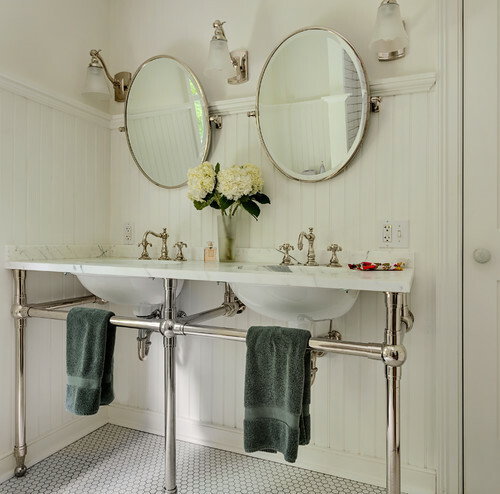 The guest bathroom features white wainscotting, as well as a chrome and marble vanity. 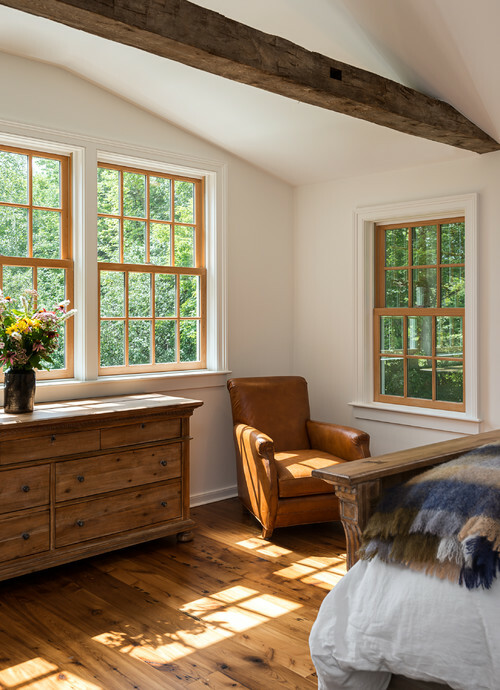 Warm wood floors add depth and character to the master bedrooms light and airy feel. 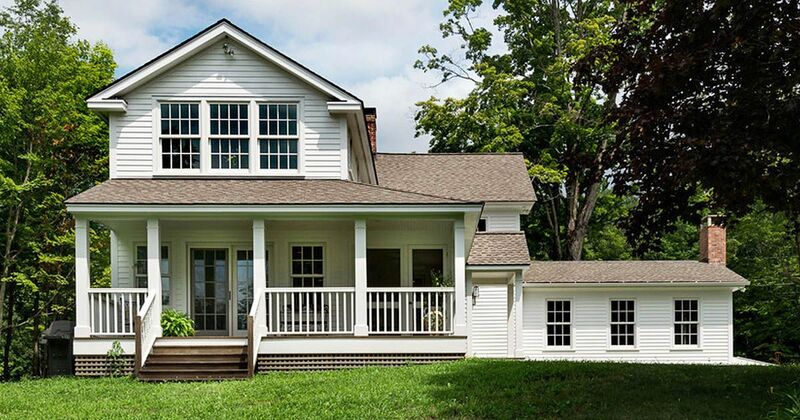 Does this restored farmhouse have you wishing for one of your own? If so, share this article with your friends on Facebook.